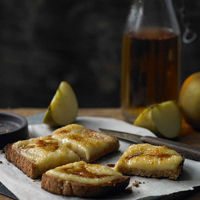 This recipe takes cheese on toast to a whole new level! Serve it ploughman's-style, with apple wedges and pickled onions on the side. Preheat the grill to medium and position the shelf at the middle level. Warm the butter in a small pan over a medium heat. Add the flour and mix well to make a paste. Cook for about 1 minute, stirring continuously. Remove the pan from the heat. Gradually stir in the ale, mixing well between each addition until completely smooth. Return to a low heat and continue stirring for about 1 minute. Mix in the cheese, mustard, and Worcestershire sauce and mix well until smooth and all the cheese has melted. Place the bread under the grill. Cook until the toast is just golden on each side, then spread the cheese mixture generously and evenly onto it. Place the slices back under the grill and cook for a further 1-2 minutes or until golden and bubbling. Serve immediately with a splash of extra Worcestershire sauce, and the rest of the bottle of ale.